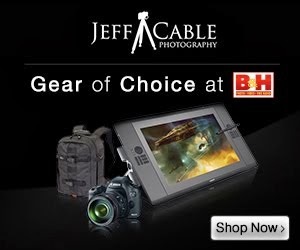 Jeff Cable's Blog: Photographing different things - Why do we have to specialize? I have often admired how you are able to photograph so many subjects and do them very well. Rather than be put off by images that are so diverse, if I were a prospective client, I would find your photographs proof that you can cover almost anything that would arise. Furthermore, since you have been in so many varied situations, it would five me confidence that you would be able to take care of any eventuality. Yes, learn the craft and then shoot what you love. I find beauty in many places even if they are out of my "usual" genres. You have a very good point. Let's see, you've left Lexar to pursue your passion, you take excellent photographs and people pay you well to take them around the world to learn from you. I've never met you yet I can't articulate all that I've learned from you. As a talented non-specialist photographer and a very good teacher, I think you can tell those Marketing experts, thanks, but no thanks. Thanks for all I've learned. I'm with you on this Jeff. My bread and butter is event photography for my employer, but I love shooting landscapes as well. The challenge of shooting something different, and doing it well, keeps things fresh, fun and inspirational. Jeff I have to admit that I still struggle with the whole "generalist" photographer thing. There are some subjects that really get my juices flowing and others that I avoid like the plague. I'm at the point where I am convinced that I need to keep the variety of subjects that I shoot on separate websites, so as not to confuse potential buyers of my work. I think it can work as long as I aim my marketing at the appropriate market. I'm curious if you find yourself selling different photography work to the same clients? IE portraits and still-life, or sports and barmitzvahs? I have so enjoyed looking through your days in Tanzania and the last two posts. I love the diversity of your photos. You have branded yourself by being diversified and I love it. I am taking photos of landscapes right now and that is the area I am focusing on first. I haven't decided what's next but you are an inspiring person to listen to on Youtube and look at the art that your produce. Thank you so much for sharing YOU with all of us!